Juan Garcia told me an interesting story. There’s a group of dancers in Juarez that dress up in the costumes of the northern Indians and, this time of year, go around to dance at places that celebrate the Virgen de la Guadalupe. One of those places is Juan’s sister’s house. They do this every year and it has gotten so big that the police closed off two blocks of the street. And the tradition is that his sister has to feed the dancers and their families, AND any neighbors that come by. His family made 100 pounds of tamales and three huge ollas (pots) of soups and stews. After the dancing they began feeding everyone. Juan said there was a long line of neighbors and he didn’t think there would be enough food. His old mother just kept saying that God would take care of it, and sure enough, there was just enough food. 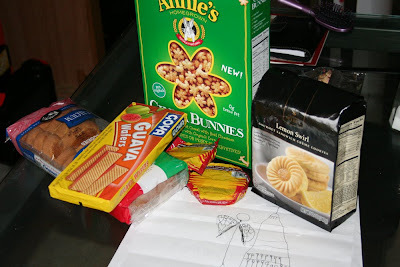 It’s a kit to do a family OLG Tea (like the one described here at Cottage Blessings). She knows that this is one of my favorite feast days so she decided to surprise me with it so I could celebrate with the kids. How sweet! 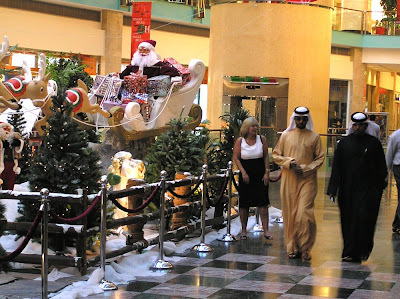 They’re from the Abu Dhabi mall, taken by my dad when he lived in the United Arab Emirates. This is a mall that includes a mosque and is wired with speakers that loudly broadcast the daily Muslim calls to prayer. If their shoppers aren’t horribly offended by Christmas trees and Santa displays, it makes you wonder whom, exactly, certain American retailers think they’ll be shocking if they do the same thing. As I was soaking up the joyous seasonal ambiance earlier this month, a terrifying, blood-curdling thought occurred to me: WHAT IF CAROLERS COME TO MY HOUSE? Singing. Interacting with people I don’t know. Unexpected visitors. Strangers at my door. It’s like the perfect storm of everything I’m bad at. Do I have to give them eye contact the whole time?! Should I sing along (no doubt to the horror of everyone)?! Do I invite them in before or after they start singing (if at all)?! Are there any customary gestures one does before they start singing (e.g. introducing yourself, making up lies about why the interior of the house is so messy), or do they just start singing as soon as you open the door?! What if I’m right in the middle of something when they show up?! Can I tell them to wait a minute…or maybe suggest that they keep singing but assure them that I can hear them from the kitchen?! This is like the sign of peace: it’s a beautiful gesture that warms my heart…but it’s just too complicated (and too rife with opportunities for social awkwardness) for someone like me. Everyone needs a scorpion paperweight. oops Jen, can you please fix up my url? 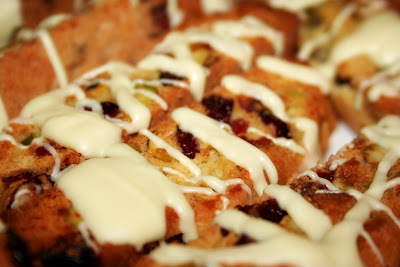 I am new to this (2nd-timer, lol)and forgot to make it the link to the actual post, not my blog. I had a good chuckle about your mother-in-law using the potty as a cup holder. It reminded me of the time, just after the birth of my first child when my mother-in-law came over to “help” me. (I was unable to walk much or to lift the baby because of the number of stitches I had.) Anyway, she freaked me out by washing the baby’s dirty plastic pants in the kitchen sink. Drool on my keyboard – your photos are (as always) amazing! 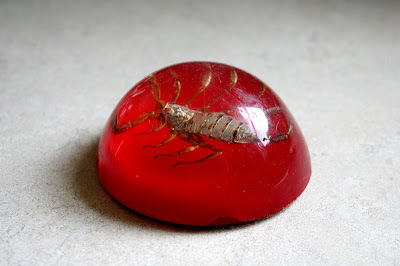 As for the scorpion paperweight…I wonder if (a) you could use it as a weapon of destruction when and if they show up in your house again (if, that is, you can keep your mind intact long enough to remember to get it) and (b) if they make those with wasps inside. Then again, if I got one with a wasp inside I would just be horrified. Or maybe not. Maybe I would be triumphant. Hmm. Your cookies look great. Now that we can stay home for a few days, we are going to attempt the same! Thanks for the Quick Takes! I love that your Dad is getting special signal graces about your special feast day. I also love that people are “spooked” that a lady would just know they needed a rosary said at the end of a dance. We know that Mary taps us a lot of time to do chores for her. That sort of goes with the territory of developing a Marian devotion. I’m more surprised by your Dad stress on the “entire” rosary thing. Was there a specific rule that an elderly person had to say the rosary to conclude the dance, or is it more that no one knew how to say an “entire” rosary? I used to be a caroler. 🙂 We didn’t expect to be invited in, or given hot cocoa, AT ALL. We just wanted to sing for someone. As long as you opened the door and let us goof off for 2 or 3 songs (although, we were mostly music majors, so goofing off sounded pretty AWESOME if I do say so), we didn’t want to interrupt your evening or expect anything in return. That’s my advice. Just smile, let ’em do their thing, clap at the end, and wish them Merry Christmas! Hi Jennifer! I’ve followed your blog for a short while now – found on one of my friends’ blogs – and really enjoy it. I hope you too will stop by my new blog some time. God bless you and Merry Christmas to you and yours. P.S. Where I live (Toronto) I couldn’t even GO Christmas caroling…the Sikhs and Muslims wouldn’t care for it….and they are a majority in my neighborhood. Drats. I enjoy your blog very much! I am a convert myself. Thanks for the 7 Quick Takes Friday. It is fun to do. God bless! Your carolers dilemma made me laugh. I’ve always felt the same way. What do you do with them? I agree, awkward. I like your take on the mall. What the heck is with the anti-Chrismas agenda? I like Focus on the Family’s Merry Tossmas idea. I actually look for Christmas references when making my spending decisions. Two weeks in a row! I may actually make Quick Takes part of my routine! 🙂 Thanks again for the idea. And that potty chair as a cup holder thing kind of grosses me out. I’m just sayin’ . . .
We carol every year, and expect nothing. Usually people just come to the door listen and then pop the door open for a quick “Merry Christmas” That is all. 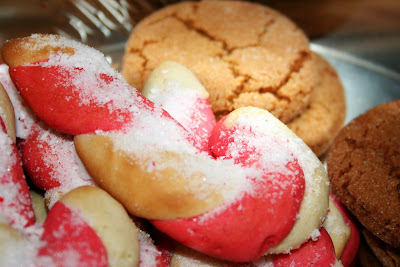 We bring our own refreshments with us, so are not in any discomfort while spreading the Christmas cheer. We used to take our Bible study group around the neighborhood caroling. I guess many of the neighbors faced your dilemma about what to do with us. From my point of view, if they came to the door, opened it, waved or smiled, maybe said thanks and Merry Christmas, it was all good. Relax. The carolers are having fun — they don’t need much help from you. What a great meme!! I’m going to have to try this next week!! Oh the tricks of a mother-in-law. Mine is doing all sorts of strange things and my baby is only 3 months old. Sorry Jen! I messed up my link somehow and ended up in the list twice. A little weird….The second link to me will take you to my page which is fine. I love the part of your quick takes where you are talking about the carolers…This happened to me once and it was akward to say the least! I think the days of caroling may need to end…. Thanks for the chance to link again. Good luck with potty training; expect to go one step forward, two steps back! Afternoon! I’m a newbie and thought I’d play along this week! What fun! Thanks for hosting this! I’m cracking up because this is the first time I’ve seen the Mr. Linky list. I’ve been reading your posts through an RSS subscription and the feed page doesn’t include the list. I’ve been wondering for weeks, “Where’s this list she’s kept mentioning and how do I get on it and how do I read others’ Quick Takes?” Well, now I know I have to click through to your regular page! 😀 I’m looking forward to seeing everyone else’s lists, finally! I enjoyed your quick takes. Thanks again for starting this tradition! I really enjoy it and it gives me something to blog about when I’ve got writer’s block! 🙂 Happy Christmas! duaghter is pregnant! I like the name Yaya! Merry Christmas to you and yours. Loved the one about fretting over the carolers. I feel the same way! Luckily, this year naked kids just coming out of the bath were a good excuse to not go to the door when the carolers came. I could hear them but I didn’t have to go through the discomfort of standing there and not knowing what to look at while they sang! i don’t know if anyone else has mentioned this, but re the sign of peace, there’s a great quote in ‘why catholics can’t sing’ — just after vatican ii there’s a little old lady sitting praying her rosary during mass. her neighbour turns to her to offer her the sign of peace. she looks up briefly from her rosary then grunts, ‘i don’t do that sh*t’. #2 – what a great story. I love reading your takes… Thanks for hosting! Really Old Mexican Ladies and Really Old Phillipino Ladies are champions of prayer. I’m not surprised in the least! Everybody knows that when carolers come calling, they demand some figgy pudding. They’d probably settle for some shortbread cookies, though! Interesting about the mall. 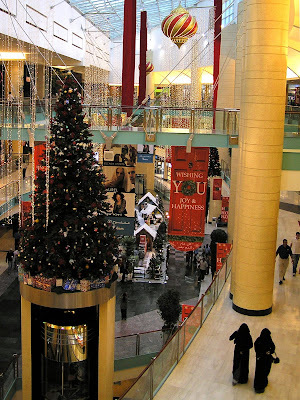 I lived in China for four years (which I loved), and malls and shops there decorate for Christmas there, too. But it’s very secular. Christmas decorations do not religious ideals make. That scorpion paperweight would freak me out! Not sure I could have it on my desk. The cookies look great. Almost makes me want to get ambitious and bake. Almost. I’ve never actually seen carolers going from house to house. Do people really do that? The first boy I ever loved wooed me with the exact same scorpion paper weight! His name was Daniel, and he was my desk buddy when we were 7. He came back from Christmas vacation with a scorpion paper weight and showed it to me behind our desk when the teacher wasn’t looking. That was it for me; I fell head over heels. I am really liking the quick 7 each week Jen. Thanks so much for starting this up. posting and running! I’ll come back and read this tomorrow! ps i’ve now done my 7 quick takes! Always love your quick takes, and a glimpse into your life. 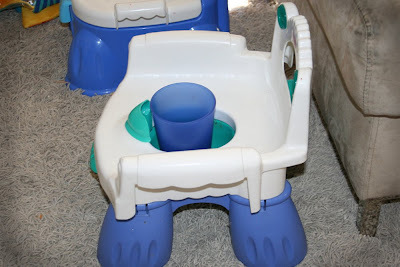 By the way, I found a cup in my son’s potty chair too – I wonder which child decided it was a good place for it. Worse than carolers is walking over to the local Presbyterian Church to view their live Nativity (on their front lawn, right at the sidewalk). My kids love it, but talk about eye contact issues! And are you allowed to talk to them? If their background recording starts narrating the Nativity story, is it rude to leave, or do you have to stay there, stupidly smiling, until it’s done? And heaven forbid one of the kids asks a question while you’re there, with the entire tableau with nothing better to do than to stare at you while you answer. I can’t help commenting on your nº5 take. Have you reached a point in your religious life when you have realized that you give way too much importance to yourself? How much do you want to be humble? You are God’s beloved daughter. This is who you are. All the rest may change and be temporary. But your deeper identity comes from God’s passionate gaze at yourself. Try to remain in the presence of that love. Ask for the gift of being able to see yourself through God’s eyes. That experience is a life-changer. With this in mind, what is the problem of being awkward when being visited by christmas singers? You will be embarrassed? Good! Mother Theresa used to say there is no humility without humiliation. And, let’s face it, this is a very mild humiliation. It’s not as if you got miraculously pregnant and had to tell your fiancée about it. Have a holy and happy Christmas! cookies? I would appreciate it. Also.. I enjoy all of your writings, including those where you sweat the small stuff i.e. focus on your foibles, self-consciousness, social maladroitness etc. God bless you. We used to carol around my in-laws neighborhood (before they were my in-laws) and we loved it, and thought the people we caroled to did, too. But reading all these comments from people who wish caroling would be retired makes me wonder. It’s so sad! We don’t really care if you keep the door open or closed, if you look at us or at your kids, if you offer us food or not (we always had cookies and cider waiting at home for afterward). We just want to share a bit of joy with you through song – a brief smile or “Merry Christmas” was welcome, but not necessary. I never realized it could be so traumatic! Sometimes, if no one answered the door, we’d sing one song all the way through, just in case they were there listening anyway, and then we’d move on. That might work for you, though I bet your kids would like to see the carolers – unless they are feeling shy. I “grew up in the church” but still think caroling is one of the strangest phenomenons. I mean, would a bunch of people dress in Hawaiian shirts and go around the neighborhood singing songs from the Beach Boys? Hello? Strike you as odd? I just stumbled onto your site and its very inspiring! Thank you!! On #1: Does Yaya ever read your blog? 🙂 Does she know that you occasionally write things about her that hundreds of strangers read? On #5: I’ve found that all that uncomfortableness in social situations comes from a very deep-seated fear of exposing my own ignorance to others. Realizing this, and praying whenever I find myself not knowing what to do, has helped tremendously. Do you remember that post you wrote way back when, about discovering that you actually knew what God’s will was for you in most situations? This is like that. Think about how God would treat carolers, or how he would balance carolers and doing something else, and it will probably all become clear; but only if you can get past the voices in your head that say you are doomed if you don’t get everything just exactly right. I’ll try to remember to post those. If I forget just email me! I’ve lived overseas since I graduated university – first in Scotland and then in Korea – and I’ve done a lot of travelling. What I’ve discovered is that most cultures/people are very open to not only experiencing but also sharing in the traditions of others. The problem in North America, as I see it, is that because of the overwhelming Christian influence, there is not the same opportunity to choose to share, rather than have it forced upon you. There can be many uncomfortable moments that result from people from a majority making assumptions. However, I think that if North Americans were as interested in sharing in other religious and cultural traditions as they are in insisting that Christmas is under some sort of attack, they would find people more open. Go visit a mosque and a synagogue. Participate in some First Nations drumming. Talk to your multicultural traditions and participate. Then see how they feel about you dropping by to carol. My experience living overseas suggests that it would work. Christmas in Korea is a very different thing. It is sort of more secular – which is not to say that people here aren’t religious – many are and Christianity is huge here. However, since family style celebrations are already covered by Chuseok (sort of Thanksgiving-ish holiday) and Solnal (Lunar New Year), Christmas here is more of a date night for couples or a church event without a lot of surrounding fuss. There are a ton of Christmas lights and decorations, but then, this is a country that is fond of neon lights, so that is no surprise! I had a desire to start my own company, however I did not have enough amount of cash to do it. Thank God my close dude suggested to take the personal loans. Thence I used the auto loan and made real my desire.